June 2, 2016 at 4:00 pm. Update: @JoeGooding challenged the DMCA take down notice and Twitter restored the alleged “baby photo”. Did Twitter really give out a woman’s address to her stalkers, or is a public figure attempting to silence her critics? Here’s what Business Insider didn’t tell you. Last week an article published on Business Insider, by Julie Bort, accused Twitter of giving out a woman’s personal address and phone number to alleged stalkers. The story portrayed an innocent, un-named woman targeted for harassment on social media, who was supposedly duped by Twitter into filing a DMCA copyright infringement report, releasing her personal information to her persecutors. The ‘terrified’ woman went on the offense, producing a wild, 20 tweet tirade against Twitter, resulting in a fair amount of online sympathy, and the Business Insider article. DMCA notice received by alleged stalker (@joegooding) who tried to reach Julie Bort to go on the record to clear his name. Shows description of original work and alleged infringement. The photos she was filing DMCA notices for in May 2016 were NOT photos of her kids. They were photos of her posing with Hillary Clinton and another photo with her and Senator Pan, Senator Allen, and other members of an activist organization that she co-founded. The photo was included in her blog post about her involvement in “issue campaigns” and role in shaping public policy. She claims stalkers located and stole the photo of her with Hillary Clinton from her Dropbox account (without explanation as to how they obtained access), but which she declared under penalty of perjury in the DMCA report was stolen from her Facebook page. For the record, true harassment and stalking is inexcusable. However, those who cry wolf and make it harder to distinguish between real victims and those abusing the trust of society should also be held accountable. Fake victims make the world unsafer for those in true need of protection. This woman is a public figure. She is a business leader in the tech community, and also founded a high profile campaign organization with the intent of changing public policy. She speaks publicly both for business and public policy events. She is a published author and business investor who partners with legislators and lobbyists, and advises on use of social media. This same woman is notorious for an incident where she misled others at a politically significant City Council meeting into believing she was a distressed mother with an injured child waiting in the car, so she could be first to address the council, only to spend her time shouting at the council members about the people who had just tried to help her. After her now infamous diatribe, she stayed close by, using intimidating body language, mouthing off threateningly (actually requiring the Mayor to shush her), and then aggressively advancing and laying a hand on a bystander, in what might be called, at best, deranged behavior. This can be clearly seen on the City Council’s public video. She frequently stirs up trouble online, cleverly spins it to her benefit, then gets articles published in Wired, Huffpost, Slate, Jezebel, and now Business Insider, using these media outlets as unwitting accomplices in her personal agenda. Those who don’t know this side of her reasonably rush in to sympathize and defend. This social media expert’s tweeted tantrums are designed to mislead people into thinking a private, inoffensive person is being baselessly targeted, when in reality she is a very public person experiencing criticism for her egregious antics. 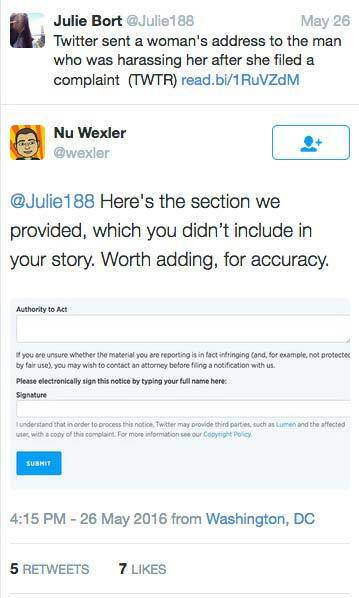 Julie Bort has ostensibly ignored Nu Wexler, public policy communications director at Twitter, who pointed out in a tweet a crucial omission. Here’s the section we provided, which you didn’t include in your story. Worth adding, for accuracy. In other words, Business Insider is guilty of more than a simple mistaken rush to judgment. 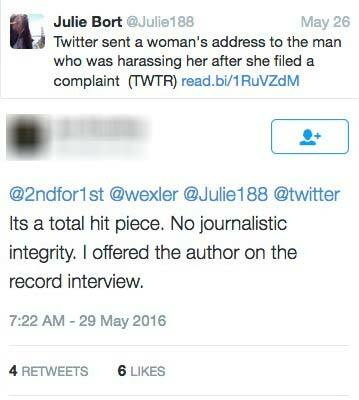 Twitter has shown it is faultless in the matter, yet neither Business Insider nor Julie Bort has done the right thing and set the record straight as of June 1st. Why would Bort intentionally leave out this critical detail? Interestingly, Business Insider previously named this woman one of “The 100 Best Tech People On Twitter”. Julie Bort shirks her obligation to address the personal responsibility of the woman who purportedly neglected to read what she signed in the DMCA (and how it sends a copy of the report to the infringer). This was not a case of simply overlooking the fine print. 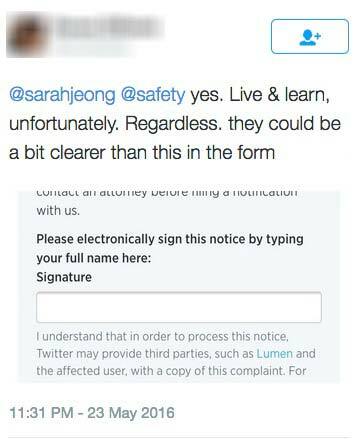 She filled out a form and signed each DMCA notice she sent off, under the penalty of perjury. Not 1, 2 or 3 notices. She missed the notice over 15 times! This is the woman who claims Twitter sent her address to stalkers. 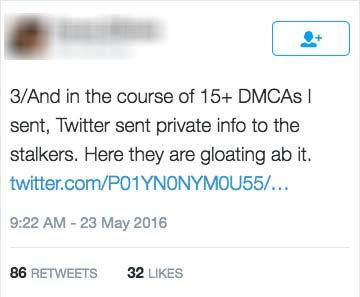 She admits that she filed over 15 DMCA notices without reading the legal notice. Again, the accuser admits the notice was there. Woman admits again that she made the mistake. Keep in mind it was over 15 times. 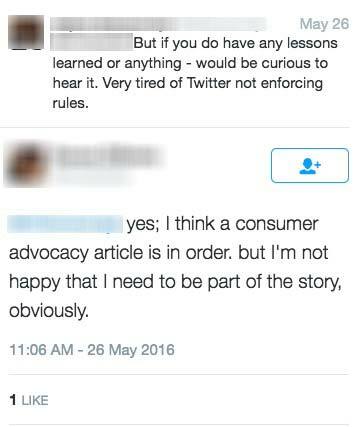 Rather than apologize to Business Insider and her followers for her alleged mistake, the woman continues to advocate for a change in policy. One is left to assume we should all be expecting the second half of her “issue campaign” to roll out very soon. Julie Bort has turned a deaf ear to those reaching out to bring balance to her one-sided article. The man whom the ‘injured’ woman chiefly accused of stalking and harassing reached out to Julie more than once, and offered to go on record to clear his name, yet it is complete radio silence from Julie. Alleged stalker tries to reach Julie Bort to go on the record to clear his name and defend allegations. One can only conclude that Julie and Business Insider have no interest in accuracy or fairness in reporting. Apparently, Journalism 101 is sadly obsolete today, and the reason why blog posts like this and outlets like Twitter are vital to maintaining an alternative and free media. Unfortunately, Twitter has to deal with people like this woman who abuse the reporting system all the time. And when people like her don’t get their way, they pull spectacular stunts, to get the attention they want, to control the people they want. Twitter handled this one professionally and effectively. Many thanks to them for recognizing false reports of harassment and not caving to manipulation. Business Insider should take note and follow suit. Glad the truth is being told! How about a temporary block on her account for false reporting! 2ndfor1st April 27, 2018 at 4:50 am. 2ndfor1st April 26, 2018 at 12:00 am. 2ndfor1st June 13, 2016 at 11:24 am. Federal Land Grab Awards Party - National Park Service employees in attendance. 2ndfor1st January 22, 2016 at 3:54 pm. I pledge to vote for the Democratic nominee for President in 2020 no matter who it is. @doritmi Looking at law school salaries, no one else is paid $226,000 for teaching 2 hours a week. Are you worth $2,900 an hour, Dorit? @doritmi Dorit, you are nothing but a mouth piece for pharma with zero credibility and no one respects you as a professor. You have never passed a bar, you are not a lawyer, and you have sold out the Jewish faith. Our FOIAs are just getting started. $226,000 last year for NOTHING. @doritmi Dorit, if you know what's best for you, you'll get lost and not come back here. I have no patience for your elective ignorance.